The Protector of the Concord Dawn The Rebels continue their search for a base and realize they need to find another hyperspace route to avoid the Empire. After some discussion, Sabine reasons that going through the Concord Dawn System (in control by the Mandalorians) might be their best bet. Rebel Commander Sato agrees to investigate this opportunity and sends Phoenix Squadron, led by Hera and Sabine, to check it out. The opening of this episode leading to the first commercial break is one of the best openings of the 2nd season so far. It had me interested and invested. In one of the things that I had been hoping for we see an opponent that is formidable and that adds to the drama. It was good to see what was happening between Mandalore and the Empire. There is a sense of history and tradition with the Mandalorians that gives a worldbuilding depth to the episode. Also, the Kanan Comic (issue #11) that released the same day as this episode deals with some of the things that Kanan references during a conversation with Fenn Rau (the episode's antagonist). Thank you Disney for continuity! This is also the second episode this season that deals with Sabine and her background. For some reason I found Sabine to be much more of a compelling character in this episode than in the previous ones. In some dramatic encounters with the Mandalorians we see Sabine reveal a little more of her background. And it is compelling. Sabine also provides the best surprise in the episode. After this episode I can see young people (and old) fall in love with her more and more. Sabine is cool. For me it was the first time that I was really sold on her as a character. I am happy to say that for the first time I can’t wait to know more about her. One final thing to note… Kanan has the best line: “What is it with you Mandalorians?” In its context it is a wonderful moment. Not much. It is really that good of an episode. The only thing that I found a little off was how easily one of the characters changes their mind about helping the Rebels. When you see it you will understand. It is not that it doesn’t work. It just feels a bit off and too easy. 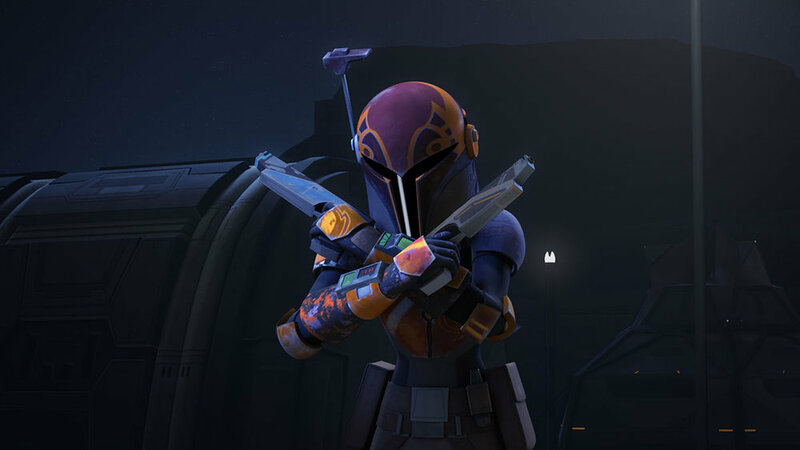 Overall, this is one of the better episodes of the season and it gives Sabine a huge platform to show how cool she is.